This new Super Mini Jungle Plus is improvised with a hand grip handle for better gripping, a metal hand guard for safety of hand and now with a flat tang blade for more durability to the blade and handle. This is the smallest working kukri manufactured by Khukuri House Thamel. The blade measures 6" and therefore called the super mini jungle. It is very light yet very effective while working and most importantly very easy to transport because of its cute size. 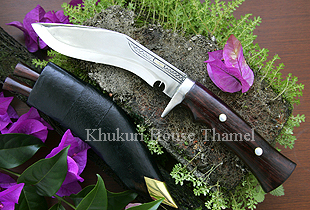 It is also the replica of original Nepalese Bhojpure kukri. It is the kind of size a young lad of Nepal in the hills would get to use at this age. This size will be his first Kukri before he gets older to use a standard men size. This will be used for protection and while working in the forest. This size is highly recommended for camping, trekking and hiking.